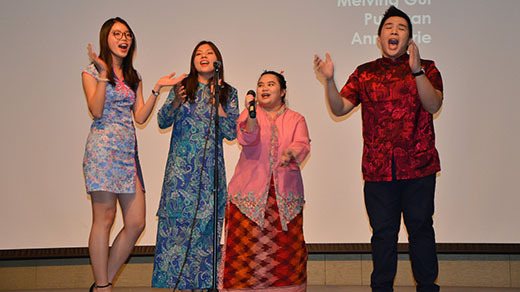 With students representing approximately 25 countries, Upper Iowa University’s Center for International Education and International Student Association will host the “Silk Road” cultural night celebration at Fayette Campus Monday, March 26. Adults and children are invited to participate in the free festivities, which will begin at 6 p.m. on the upper level of the Student Center. A buffet-style meal featuring international foods and refreshments will be served throughout the event. Among the scheduled activities are henna and calligraphy demonstrations, trivia and children’s games, a photo booth, music and dancing, a martial arts performance, a fashion show and other presentations. Megan Kohr, UIU international student services coordinator, explains that Silk Road routes stretched from China through India, Asia Minor, up throughout Mesopotamia to Egypt, the African continent, Greece and Rome. Different kinds of merchandise traveled along the Silk Road, including the highly sought after Chinese silk by the west. For additional information, email international@uiu.edu or telephone 563-425-5884.